California’s population grew at a rate of 0.7% in 2017. This is a slightly quicker pace than the prior year, but the overall trend since 2009 is a declining growth rate. The annual rate of population growth is usually closer to 1%. 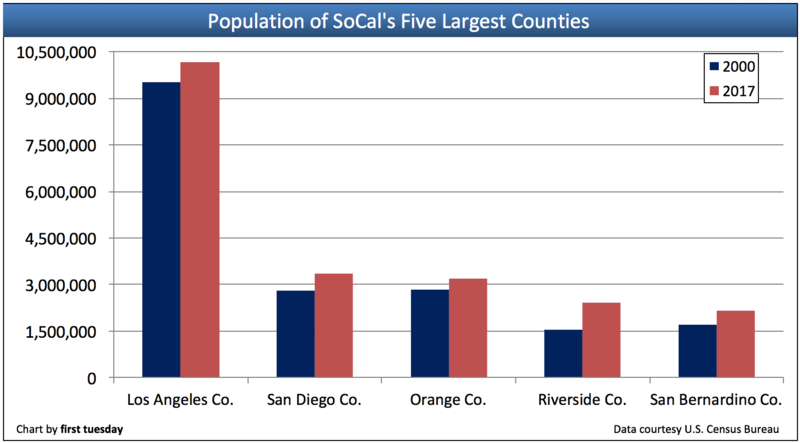 County-level data show population increases in all of California’s most populous counties. Of the state’s ten largest counties, Los Angeles saw the smallest increase of just 0.3% in 2017 (the most recently reported Census year). Riverside County experienced the highest growth of 1.9% from 2016 to 2017, reflecting a turn to the state’s less costly inland regions. Steady population growth is essential for a long-term, stable housing market. The rate of California’s population growth, while continuing up, is forecasted to vary in step with other economic and political factors, bringing with it new household formations and demand for residential rentals and sales. Updated September 19, 2018. Original copy posted June 2011. This article reviews the current shifts in California’s population, and examines the potential impact of migration trends on residential rentals and sales. The first of the above charts tracks the annual change in California’s total population since 1980, based on data about births, deaths and immigration as revealed by the U.S. Census. 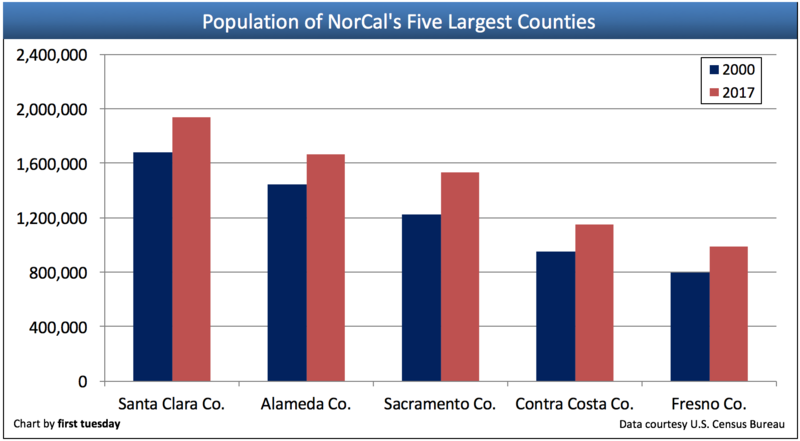 Two charts track population change in California’s ten largest counties. Coincidentally, the five largest are all located in Southern California, and the following five are all in Northern California. State population growth is essential for a stable housing market. Brokers and agents who know which demographics are likely to move to and from California’s diverse counties will be better positioned to accommodate the needs of those groups when they arrive. California’s rate of population growth varies from year to year, as seen on the first of the above charts, but it has always increased over time. A year without growth in California is almost unheard of: according to the California Department of Finance (DOF), only three counties statewide (Plumas, Sierra and Alpine) saw their populations diminish in the first decade of the new millennium. 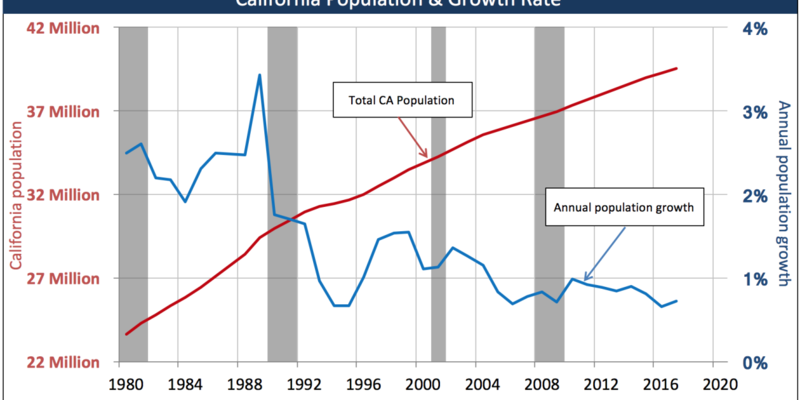 Editor’s Note: Even with all population fluctuations taken into account, California’s population growth rate since 1990 has been slightly lower than that of the nation as a whole. The average population growth rate in California during the 1990s was 1.3%, ranging from 1.8% in 1990 to 0.7% in 1994 and 1995, the first years of job recovery after the 1990 recession. Growth in the 1990s and 2000s was far below the glory years of the 1980s, when California’s population grew by an average annual rate of 2.4%, and rose by as much as 3.4% in 1989. The low growth rates of 1994 and 1995 appeared to be nothing more than a passing abnormality brought on by the 1990 recession. However, high housing prices carried over from the real estate boom of the 1980s and the economic crisis of the 1990s combined to make the mid-1990s growth figures the new norm. For the first decade of the new millennium, the average rate of population growth was 1%. The greatest increase in population occurred in 2000, the year before a recession, with a one-year growth rate of 1.48%. A similar jump took place in 1989, just before the 1990s recession, when California’s population rose by a full 3.4%. The smallest increase took place in 2006, at the height of the Millennium Boom, when the population’s decelerating growth rate slipped to 0.5%: the lowest rate since WWII. While numerous temporary factors influence the rise and fall of California’s population, including birth and death rates, migration, cultural trends and environmental factors, the most important influences by far are economic. When jobs are plentiful, and housing is available at reasonable prices without the need for significant new construction, people feel empowered to realize the dream of residency in the fabled cities on the Pacific West Coast. A strong economy is an incentive for both interstate and international immigration. A weak economy (like that produced by the Great Recession) discourages the optimistic and causes people to stay where they are. Indeed, a state without jobs can even lose people, as they leave for more employment-friendly environments in other states. Historical population trends are thus a valuable contextualizing tool for economic recessions (marked by gray bars on the chart above). The recession of the early 1990s, for example, corresponded with a dramatic decrease in the rate of population growth; the year-over year increase in state population has never since risen back to its height at the end of the 1980s, when the plentiful Baby Boomer population formed households across the state. 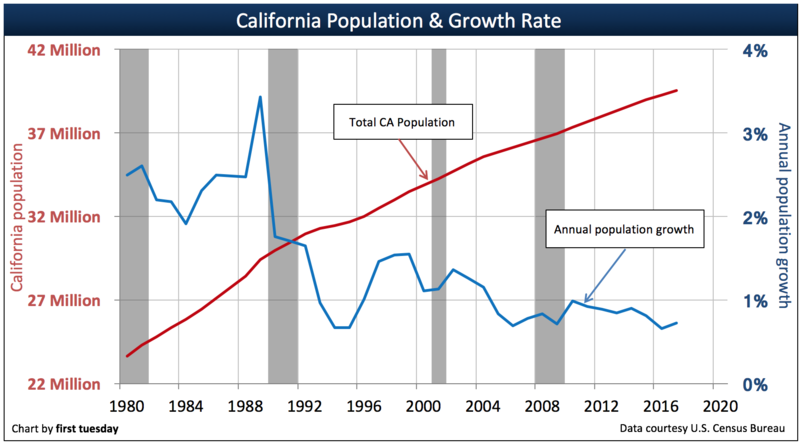 However, the 2008 recession had no comparable decelerating effect on the rate of California’s population growth. In fact, California’s population has increased at a greater rate since the start of the recession than at any time since 2003. This is likely because the Great Recession, unlike the 1990s and early 1980s recessions, was accompanied by a tremendous drop in housing prices. This drop returned prices to their historic trend of slow but dependable increases, correcting for the distorted pricing that drove the population away from California in 2000-2006. Suddenly, California real estate was once again available at prices comparable to real estate in the rest of the nation. Those who had been waiting to move west had begun to take advantage of the opportunity, and more will doubtless come as our jobs recovery continues apace. Immigration, both authorized and unauthorized, is a crucial driver of population growth on the West Coast. This includes migration to California from other states and other nations. The largest proportion of international immigrants to California, by far, come north from Mexico. According to the U.S. Census Bureau, 38% of California’s population in 2013 was Hispanic, and this proportion has increased annually for the last twenty years. For reference, in 2013 the National Association of Hispanic Real Estate Professionals reported the homeownership rate among Hispanics in California is 46%, compared to the statewide average of 54% (and dropping). The vast majority of immigrants (both interstate and international) go to Los Angeles County, with an average of just over 76,000 people migrating legally to Los Angeles every year since 1984. Orange County, Santa Clara and San Diego are also attractive destinations: each has an annual average of over 14,000 (legal) immigrants. The number of legal immigrants tends to fluctuate at approximately the same rate as the total population. Although the state’s birth rate and statewide emigration are both crucial factors influencing state population, immigration has made up an average 58% of the yearly increase in state population for the last twenty five years. Undocumented immigrants, who are legally able to buy property, borrow mortgage funds and pay property taxes by use of an Individual Taxpayer Identification Number (ITIN), are of equal importance to the state’s housing market. The Pew Hispanic Research Center estimated that an additional 11.3 million undocumented immigrants lived in the United States in 2013, up less than 1% from the prior year. This is down from the peak undocumented population of an estimated 12 million in 2007. The decline is the first significant drop in the number of undocumented people in the United States since the 1980s, and was precipitated by the Great Recession and the corresponding decrease in job availability. Undocumented immigrants make up an estimated 3.5% of the national population. California has the highest portion of the nation’s undocumented immigrants, with an estimated 2,450,000 as of 2012 according to Pew. California’s high rate of immigration, including the unauthorized immigration which results from its proximity to Mexico, is a largely positive economic force that continues to improve the standard of living and employment situation for many California natives. 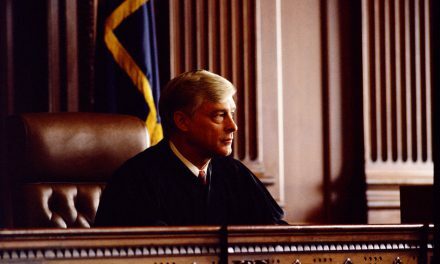 In a recent report, the San Francisco Federal Reserve determined that competition for employment between legal workers and undocumented migrants is far less prevalent a problem than is generally believed. The (generally) less educated migrant laborers, who tend to have less knowledge of the English language, tend to take jobs in different sectors than their English-speaking neighbors. The result is increased wealth across the state. Reports of competition with the native-born population are often exaggerated to become myths. Just as importantly, every new arrival on California soil needs some form of shelter to live in. Again, in spite of popular opinion to the contrary, immigrants often have a positive effect in the housing market—they have the power to buy and sell property, pay taxes and contribute to all forms of economic activity. As brokers and their agents develop their businesses to meet the new real estate paradigm, immigrants will remain a crucial part of the puzzle, despite often being neglected by trade union brokers. This will be especially true in the suburban areas, as the Boomers retire and sell their property, and are replaced by immigrant homebuyers. In 2013, 4,965,174 Californians moved from one residence to another (13% the total state population). 77% of relocating Californians remained in the same county as their former residence in 2013. 21% remained in California, but moved to a different county. The vast majority of these movers were between the ages of 18 and 34. Keep in mind that a large portion of this age group continues to rent rather than buying a home, muting, but not negating, their influence on the single family residence (SFR) housing market. In 2013, the homeownership rate among those aged 30-34 in the Western Census Region (which includes California) was 41%, and for ages 25-29 was 29%. Renters are far more likely to relocate than homeowners: the annual rate of relocation was around 20% for renters, and 6% for owners. Negative equities will continue to drive the owner relocation percentage even lower well into this decade, to the dismay of multiple listing service (MLS) agents and builders. Although first tuesday anticipates more and more senior citizens will change their residences in the upcoming years as the Baby Boomer generation retires, DOF data indicates the greatest number of new homes tends to be purchased by the young. In 2013, the moving rate among those aged 65 and over was only 5% annually. Aside from age, other demographic factors played a smaller role in determining mover status. Intuitively, men were very slightly more likely to relocate than women, singles were more likely to move than couples and those with more education (a bachelor’s degree or higher) were more likely to relocate than those with less. These profiles will drive Generation Y (Gen Y) coming of homeownership age this decade into rentals, often in urban cultural centers. As usual, employment and incomes are essential factors. Those with incomes of $50,000 a year or over (often members of the older population) were somewhat less likely to move than those with lower incomes. In collaboration with the U.S. Census Bureau, the DOF monitors and forecasts both interstate immigration and intrastate migrations. They present a clear view of which parts of the state are growing or shrinking fastest. While some county populations have remained stable over the last ten years, others have seen their populations explode. The enormous popularity of Riverside County during the decade is easily explained: as the DOF data indicates, it’s all about housing. For much of the last decade, housing prices in Riverside county grew at a steady rate (one which forecasters erroneously predicted would last forever) while still remaining far more affordable than the coastal cities of nearby Los Angeles, Anaheim/Santa Ana and San Diego. What’s more, Riverside is close to the jobs and cultural opportunities of those cities, and shares in the fair weather and romantic mystique of southern California. Nearby San Bernardino also benefited from the same combination of advantageous factors. It should be noted, however, that Riverside’s population boom was not without its disadvantages. While the county saw new prosperity and expansion in the years leading up to 2007, it was also ravaged by some of the worst job losses (only just regaining pre-recession levels in 2014), unemployment and negative equity problems of the 2008 recession. Areas which saw less dramatic growth, like San Francisco and parts of Los Angeles, suffered far less and recovered more quickly than Riverside (although no part of California was wholly spared the ripple effects of the recession’s wrath). In upcoming years, first-time homebuyers may be more hesitant to move to locations like Riverside, which once appeared to be suburban success stories. Instead of a continuation of the suburban lifestyle, first tuesday anticipates an increase in centralized urban populations, which will be especially reflected by a boom in rental property and condo sales in urban centers. Urban locations offer access to a world of social and cultural activities which are unavailable in strip-malled suburbia. More importantly, the Great Recession has exposed the folly of the U.S. Government’s former policy of “universal homeownership.” New buyers will be far more likely to think twice before they invest their life’s savings subordinated to the risk of a long-term mortgage. Related article: Rentals: The future of Real Estate in CA? The shift to rentals, and to cities, will only be accelerated by the impending retirement of California’s most powerful demographic: the aging Boomers. Upon retirement, numerous Boomers can be expected to sell their homes and move to new locations, often closer to the coast or closer to their grandchildren. The Boomers are overwhelmingly a generation of homeowners, and most will continue to be in the future, regardless of where they relocate. The majority will remain in their current communities. Others, however, will elect to rent in more convenient locations or to move in with family members in the increasingly available casitas or granny flats (which were recently made legal statewide). The first-time homebuyers who will take their place (Gen Y), will be less numerous and less eager to buy homes (much less in suburbia) than their parents. As the West’s largest city, Los Angeles will undoubtedly remain the population center for the foreseeable future. Los Angeles County is forecast to have a population of 11,214,237 by 2020, and will exceed 13 million by 2050. For comparison, the DOF predicts California’s second and third largest counties in 2050 to be Riverside and San Diego, both with anticipated populations of just over 4 million. Orange County is predicted to fall behind, and has already shown signs of being hindered by its governmental and private restrictions on land use and development opportunities. Although nothing is certain when predicting the future, one thing does seem highly probable: California will continue to grow, and to flourish. DOF forecasts expect the entire population of California to increase by approximately five million people every decade through 2050, and some cities are likely to double in size if they alter land use and height restrictions and allow for population density to increase per square mile. While an increased population will pose new challenges in water management, energy and housing sectors, it will also be a source of new talent and new opportunities. No other state in the nation has the wealth, resources, entrepreneurial spirit and innovative history that enables California to maintain its distinctive appeal to the rest of the nation. As time passes, and more come to share in that success, the Golden State’s appeal can only be expected to grow. PreviousMay a homeowners’ association (HOA) collect assessments from an owner after the owner files for bankruptcy? digg it and in myy opinion suhggest to my friends. It just doesn’t feel like a .7% growth rate, especially in SoCal. Lots of new housing developments being built outside the bigger cities. Lots of new apartments and condos going up in the cities. People converting garages to rental housing everywhere. Multiple generations of the same family doubling up. 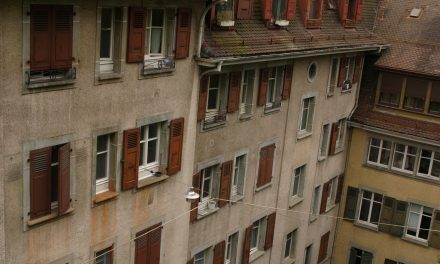 Homeless people not able to find housing. Freeways getting more jammed. It just feels more like 7% than .7%. More stupid people voted for Brown vs. Genius Meg Whitman…. another “gang of olive size brain adults”. Stupid Voted 4 Obama, Stupid now experiences 4 years of KRAP. Be smart & Vote for a Hedge Fund Genius!